Our natural color artificial grass-like table skirt is 30" long x 108" around. 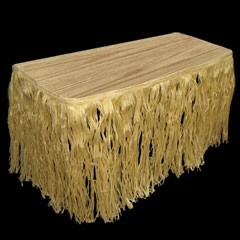 Looks like raffia and is a perfect choice to enhance your table for your tropical party. Our artificial grass table skirt is sold by the piece. Please order in increments of 1 piece.